If Hollywood filmed this sequel, the studio would call it “Probes II: More Battles Against Misunderstandings.” Like the blockbuster before it, Volume 2 will reveal the surprising misconceptions students bring to the classroom—so you can adjust your teaching to foster a sound understanding of science. 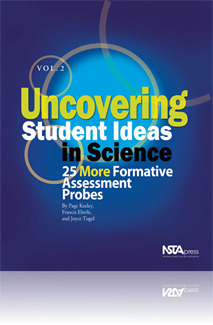 This new classroom tool will help you not only uncover students’ existing ideas, but also use that knowledge to improve your teaching and advance student understanding of science concepts. Read a sample chapter: What’s in the Bubbles? I like how these books are tutorials with different "teacher talk" for the audience, elementary, middle, and high school. I like this so much I had every teacher in my PD class buy them. I will be buying the third one.